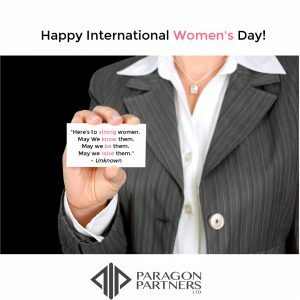 Happy International Women’s day from Paragon Partners! Did you know Paragon Partners is a privately-held, certified woman-owned corporation? President and CEO, Neilia LaValle was the woman who started it all for this professional and successful real estate/consulting services firm. Thank you to all the women at Paragon who continuously work hard to make this firm successful every day! And thank you to all the men who support our women and help Paragon achieve its goals!